Central to the concept behind Ehlenberger's Venusian World, including the Venusian Gardens and dioramas, is the modular system of interchangeable components of the work. Ehlenberger's Venusian sculptures consist of separate components that are interchangeable and therefore allow for flexibility in design. The neon tubes are designed wireless and are mounted in pyrex glass housings that enable each neon tube to be easily replaced or exchanged within any Venusian sculpture or garden. In addition, the glass components of the flowers are also interchangeable. Finally, the bases that support the sculptures and gardens are designed to allow for different components and/or configuration of components so that each garden or component of a garden can be easily changed without the need for tools or wiring. As such, one may "pick a Venusian flower" in a garden and place it in a new and different base thus allowing for personal customization of the sculpture. There are several components to each sculpture (see links below for images and more detailed information). Essential to each is a base that houses the neon transformer that powers the neon tube(s). The bases are designed for individual or group display. Each base has one or more pyrex glass housings for mounting the neon tubes. Each pyrex housing has a brass spring that allows for wireless electrical contact to the electrode of each neon tube allowing for easy mounting of the neon tube without the need for wires or tools. The sculpture bases are constructed of either wood (mahogany or oak), ceramic, metal and/or acrylic. Some bases are designed for indoor and outdoor use, some for hidden installation under rocks and others with specific aesthetic attributes for a variety of applications. Also essential to each sculpture of course are the neon tubes. The neon tubes vary in size, shape and length but for the most part are interchangeable within each sculpture, allowing for obvious physical limitations. Some bases, however, are designed to handle less number or overall length of neon tubes than others. 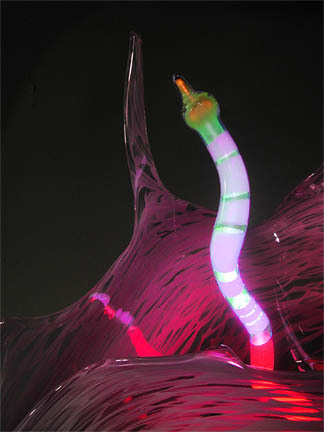 While some sculptures are designed to consist only of a base and one or more neon tubes, many are designed to include additional components, especially glass, to further develop the style of the sculpture. Usually these glass components are mounted directly over the pyrex housings that hold the neon tubes thus creating the image of the neon tube emerging from the glass form. Generally speaking, the forms and shapes of the glass components serve to define the sculptures, i.e. Venusian Swamp Flowers and Venusian Swamp Lotuses etc. However, the choices of bases, glass forms and neon tubes offer a variety of combination options leading to many manifestations for a particular sculpture. In addition to elements such as the glass forms designed to directly interact with the neon tubes, there are also other elements incorporated into some of the sculptures including "Venusian Ice Rocks", "Venusian Bog Grass" as well as other elements of cast glass, wood and stone. One particularly unique element in Ehlenberger's Venusian World is the use of uranium glass in some of the sculpture. Uranium glass is unique in its ability to fluoresce when exposed to blacklight. Incorporated into some of the sculptures are blacklight LEDs and blacklight neon tubes that provide subtle illumination of the uranium glass stimulating its characteristic fluorescent glow. The result is that the uranium glass glow provides a beautiful yet subtle luminous element in Ehlenberger's Venusian World.